JUDEA. JUDEA. Approx: 13 cm (5.5"). Beginners. (Ages 5-7). Item # 105. SAUCER OIL LAMP. 1000-800 B.C.E. The oil lamp was always a common means for lighting (with the use of olive oil) and a burial gift in the lands of the Bible. Shape and ornament changed through the periods. Pinching the rim thereby forming an aperture for the wick shaped the saucer lamp. Such have been found in the mountains of Judea, the Kingdom of Saul, David and Solomon. 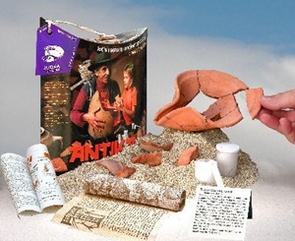 Bible study tools present models of - 3D pottery puzzles Kit - Bible period replicas of Biblical Oil Lams, Jugs , Vessel, Qumran jars, Megiddo bowl, Jordan river jars, Judea vessel, Caesarea pottery vessel , Samaria jars and more, Bible Land Shop models of the Holy Land Bible Time potteries are important aids for Sunday school, Churches, Synagogues and home. The restored clay Oil lamp can be used with any vegetable cooking oil and a wick made of twisted cotton wool. * Made and Shipped from the Holy Land * Handmade by a Skilled Potter * High Quality * Best Price Product.